Remember when we made those washed rind cheeses? We recently tasted them, and as promised, we made a video. Spoiler Alert: Not everything we make over here turns out the way we had hoped it would. But we're learning. For example, I didn't intend to be hiding behind my hair for most of this video. But I've learned more about the importance of camera angles and checking how things actually look before barreling forward like I did here. And there's also the cheese. You'll see what I mean. It has been awhile since you saw us make Gorgonzola, but rest assured, we're still making cheese. We even made another video to prove it! Here are twelve minutes of our best amateur work. Stick around through the end and you will be rewarded with some air guitar. Enjoy! We'll be back with a tasting in a few weeks. "Gorgonzola cheese! Blue cheese! Who wants a sample?" 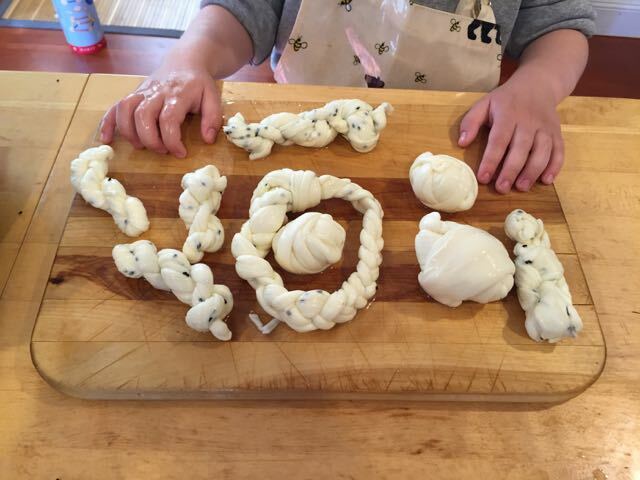 Remember back in April when we made our Gorgonzola style cheese? Well, it's now July, and the cheese has been aging in the cave for nearly three months. 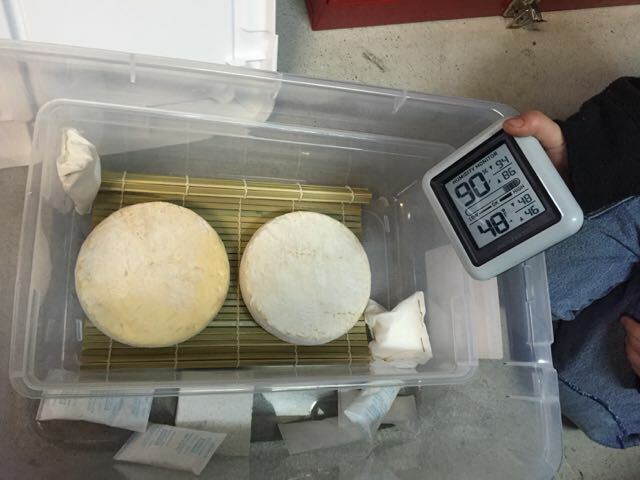 The Art of Natural Cheesemaking says aging should take between two and three months. We figured Independence Day was as good a day as any to break into our cheese and taste it. After we tasted the cheese, Wyatt spent about about thirty minutes running a pop-up cheese shop in our kitchen. He set up an area for the two of us, as workers, to be behind the counter. He then arranged a sample plate with cubes of cheese he had cut, and he added some toothpicks. Next, he ran around the house shouting "WHO WANTS A SAMPLE?" Fortunately, Marc was happy to be our customer. And even more fortunately, Marc was also up for returning to the shop again and again, pretending to be different people who had heard about the newly opened cheese shop. He was always such a good customer, too, sampling and purchasing a piece every visit, despite Wyatt's firm price of "ninety-nine dollars a pound." I have just published my third pattern! The Owl & Branch Beanie completes what I've named the Treetop Collection. It was pretty thrilling to hit "publish" on Ravelry, and I love that people are "favoriting" my designs. But there's even more to be excited about. Hard copies of all three of my patterns will be available for purchase in the Sincere Sheep booth at TNNA in Washington, D.C. and at the Black Sheep Gathering in Eugene, Oregon later this month! Obviously, I'm excited about the release of these patterns. And Wyatt is also excited, but for a different reason. He's thrilled he won't have to sit (or stand) for any more photos for a little while. This weekend included a flurry of activities related to getting knitted samples and pattern copies ready for the shows. And it also included some baking during a low-key, at-home day today. Wyatt has recently been asking for Goldfish Crackers. Or, I should say, he has been asking for gluten-free, goldfish-shaped crackers (which, as far as I know, only exist if you make them yourself). It remains my opinion that Pepperidge Farm Parmesan Goldfish Crackers are the best snack cracker ever invented. It pains me that most gluten-free crackers are terrible. If something's going to be devoid of nutrition (as most snack crackers are), it should at least taste great. Store-bought gluten-free crackers never do. When we went gluten-free four years ago, Wyatt was one year old. Parenting was very new, the toddler years were just beginning, and with the dietary restriction, the usual toddler snack foods weren't going to work for us. It was time to start figuring out alternatives. 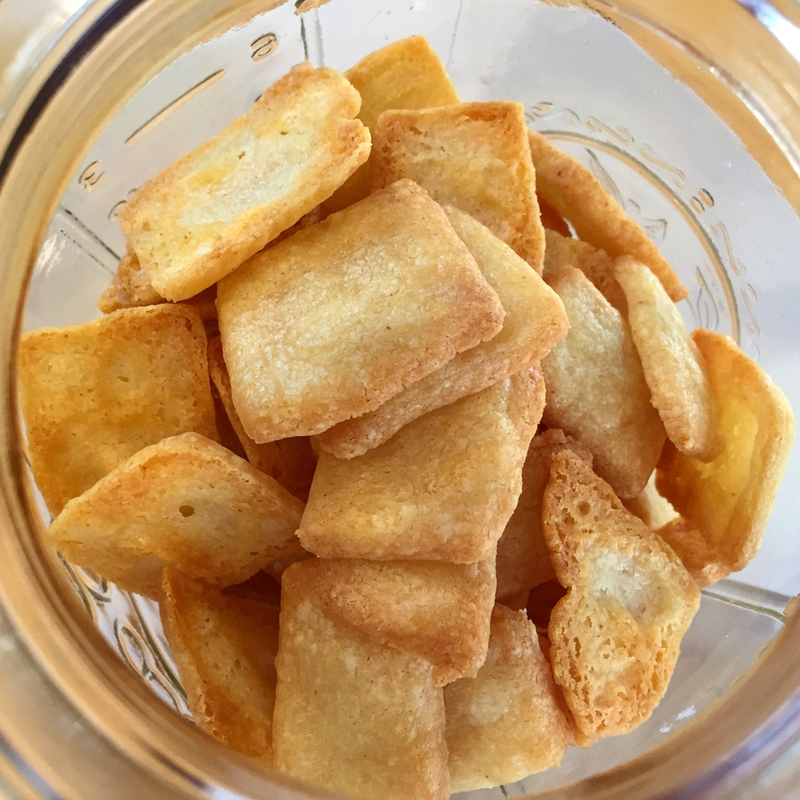 Some of the first snack foods I made regularly were Anytime Cookies and Gluten-Free Cheesy Mini Goldfish Crackers. I stumbled on the cracker recipe pretty early in my search, and I have never strayed. It's fantastic. And even though I have yet to spring for two expensive (and no doubt time-consuming to use) tiny copper goldfish cookie cutters here or here, I think it's fair to conclude that the crackers taste great whatever shape they are. (But see UPDATE below.) Wyatt would desperately like to test this hypothesis, of course, and eat crackers shaped like tiny fish. So maybe we'll spring for those cookie cutters someday. Meanwhile, though, I do like the speed with which I can make random cracker shapes with the pizza cutter. 6/5/16 UPDATE: Imagine my surprise last Thursday when we received an unexpected package that contained two tiny copper goldfish cookie cutters. Our friends had sent them. We made more crackers today, this time with the shiny new cutters. And while I would have expected the goldfish shapes to taste the same as the random shapes, they don't. The goldfish shapes consistently bake so there is a delightful bubble in the body of the fish, and this bubble vastly improves the texture of the crackers. I was right about the cookie cutters taking more time, but it's so worth it. We are still working our way through David Asher's book, The Art of Natural Cheesemaking. I love this project and the cheeses we have made! A couple of weeks ago, we made some space in the cheese cave (by eating some delicious cheese, of course) and Wyatt and I started working on our first Gorgonzola style cheese. For this project, rather than taking still photographs, I videoed the process. I shot everything on my iPhone, using my GorillaPod tripod. If you watch the video, you'll notice a bunch of first time filmmaker mistakes, especially if you really know what you're doing with a video camera (or iMovie, for that matter). But the video also shows how Wyatt and I work together in the kitchen, and we do pretty well. I was curious what it would be like to watch us, and I wondered if I would be able to put together anything decent from the footage I got. Our first day of cheesemaking took about 3.5 hours, and we worked on the cheese off and on for a week after that. 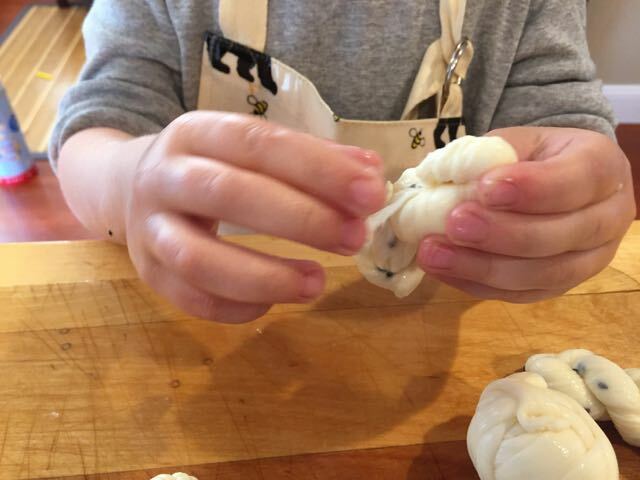 But the entire video is only about 15 minutes long—not bad if you want a relatively quick look at what it is like to make cheese at home with an almost 5-year old. With that, I give you my Gorgonzola video. Enjoy! "Mom! I LOVE that red thread! And the little face smiling sideways. Good job." The Internet was so good to me last week. As you know, we are in the midst of spring cleaning at our house. We've got until Easter to get it done, and to be honest, the verve we initially brought to this project is basically gone. Don't get me wrong—we haven't given up on the plan, but we also don't make progress every day anymore. This scenario is obviously not ideal, but why be dogmatic about the "every day" part of it if we're still moving forward? Rationalizations aside, we actually made huge progress this weekend when we bundled and donated six big bags of items. The process of clearing out closets brings me face to face with items we love but haven't worn because they need help in some way. I found a favorite jacket of mine (with a stuck zipper), a couple of sweaters (that have been worn thin in spots), a skirt (that's still about six inches too long for me), and a few of Wyatt's pants that have holes in the knees. My stack of mending is pretty tall right now, and my skills are not yet equal to the task. Imagine my delight to find that in 2014, The Guardian published some incredibly helpful "How-To's" in a series called "How to Mend." I've pinned them all so I can consult them as needed. As you can see from the photo at the top of this post, my "visible mending" techniques can use some improvement, but I'm happy to be figuring it out as I go along. You can see my first attempt at knee patches on the left. The jeans were hand-me-downs to Wyatt, and there was nothing to lose by practicing on them with my sewing machine. He wears the jeans all the time now. On the right, you can see the intentionally crooked smiley face I embroidered by hand this weekend to mend two holes (one of which is now an eye, and the other of which is the nose). My next job is to find a replacement zipper and figure out how to use the zipper foot on my sewing machine. Thank goodness for YouTube tutorials. And oh-my-stars, thank goodness for Instagram. 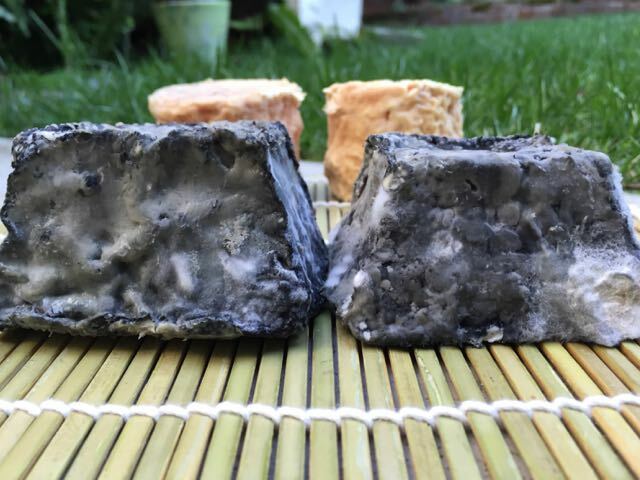 Last Thursday, I posted a photo of the Valençay cheeses that have been aging in our refrigerator. I had noticed that they were developing weird little spots of mold, and I thought I might have to compost them. When I posted the photo, I used a bunch of hashtags and tagged a couple of experts, including Louella Hill, whose cheesemaking book I own, to see what they thought was going on. Louella Hill responded! My cheeses are fine, she said. I could remove the mold, or not. The wild blue "invaders" weren't really a problem, and the cheeses should just keep aging for another week or maybe three. Louella even answered my follow-up question about where to look for more information about cheese mold (Ben Wolfe and Rachel Dutton, in case you're curious, and haven't yet followed me on Instagram). I removed the mold spots (they slipped right off the ash, interestingly enough) and things now look to be back to normal in the cave. I keep remembering how much more difficult it used to be, when we weren't so well-connected, to try something new and troubleshoot when things went wrong. It's kind of unbelievable that we can now get practically real-time, helpful feedback from people we don't know in real life. I realize there are huge downsides to social media. And I know that some people write horrible things to others online thanks to the anonymity the Internet affords. But when Instagram saves our cheese, and the Internet rescues my favorite jacket, it's only right to notice the good that's out there. "Mom. 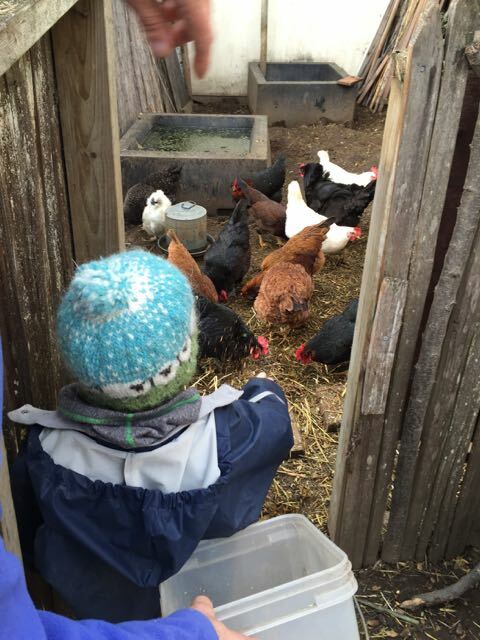 We HAVE to put stakes or bamboo sticks or SOMETHING in there for the peas to climb." Just before Christmas, Wyatt and I sowed six planters of different kinds of cool weather vegetable seeds. In some planters, we even planted two kinds of seeds. When we were done, Wyatt informed me we HAD to label the planters RIGHT THEN. But I didn't want to get out the label maker with him (because for every label I make, he insists on two for himself) and I couldn't find the masking tape. Then it rained for awhile, so I put him off some more because the labels wouldn't stick to the pots. And then we both forgot about labels until mid-January when we went outside to empty the saucers under the planters. Surprise! Everything had sprouted except the peas, the only planter and seed combination we remembered. Our little mystery garden practically pleads for me to be a better planner and organizer. The saying, "A stitch in time saves nine," also occurred to me, finger waggle and all. But rather than considering how I could become someone who does things like this right the first time, I'm thinking about the possibility that I can just learn to be more free with the label tape. Over the last few weeks, some of our mystery seedlings have begun to reveal their identities. The radishes are obvious—fast growing and decidedly radish-like by now. The peas finally sprouted and are growing taller and taller. Just yesterday, I provided a tomato cage to satisfy their grabby little tendrils. I also noticed the beginning of feathery leaves on what might be a carrot, but because everything else in that pot looks decidedly not carrot-like, I still can't reach a conclusion about those seedlings. The rest of the planters remain a total mystery. In an attempt to get some yield from all of the mystery plants, I read the backs of all the open seed packets for thinning recommendations. But because I can't say with certainty which packets of seeds we used for planting and which we didn't, or where they are, I simply attempted to average what most of the packets advised and applied that rule to all of the mystery seedlings. I like to think that if we were relying on me to grow the vegetables we'd eat this year, I would have handled seed sowing very differently and set us up for better results. Details are obviously important. And as much as I like to think I can keep all the details about everything straight in my head, I have now proven to myself (once again) that I can't. Luckily for all of us, though, I wrote down the date we wrapped our Camembert-style cheese to age in the refrigerator. We have been counting down the days until taste test day, otherwise known as this past Wednesday. Our cheese was delicious, and there was no question that we created a Camembert. The flavor and texture were unmistakable. We also started another batch of chèvre that we will age, hopefully without the unwanted ecologies from our last batch. Wyatt took to heart David Asher's suggestion to taste our cheese before we age it. He slurped up almost an entire bowl of fresh chèvre curd. As of today, we have officially run out of space in the refrigerator in which to age cheese. We are aging our blues, a second batch of Saint Marcellin, and I have just nestled in a second cave to house the chèvre cheeses. I suppose this refrigerator real estate limitation is for the best, though, because although we want to make all the cheese now, I need to focus for the next couple of weeks on the details of my knitting patterns. Believe it or not, I think I have found a tech editor, and that means I've got a deadline! Last week, I chatted with a husband and wife, parents of one of Wyatt's classmates, at a cocktail party. They were incredibly friendly and unassuming, but a few minutes into our conversation, the woman asked the question I've come to dread the most in social situations. She asked, "And what do you do?" When I'm asked, "What do you do?" I often want to shout in response, "EVERYTHING AND NOTHING!" But because that kind of response would be rude, I usually look away, maybe down at my feet, mumble something about what I used to do and what I used to be, and then trail off about how I'm now a stay-at-home mom. I'm not ashamed of my current occupation, but I am not at ease with it, either. When I was younger, I was adamant that I would never, ever be a stay-at-home mom. I remained firm in my resolve until shortly after Wyatt was born. When I stepped away from the legal profession, I had absolutely no plan for what I would do next. It has been almost five years since I quit my job, and I have yet to figure out my next move. I feel like I have never been busier day-to-day, or less productive (or less important) in the eyes of society. And while it felt liberating to shed my "lawyer" title, being a "stay-at-home-mom" sometimes makes me fear that I am betraying the feminist movement simply by breathing air. But my cocktail party friend wasn't asking big questions when she asked what I do. She was just trying to find out about me. As I began to mumble my response to her question, I felt myself look down at my shoes. In that moment, though, I suddenly noticed my feet and felt how firmly they were planted on the floor. Feeling unusually calm and secure, I looked up at her again, and just as, "I practiced law for awhile, in Los Angeles and here in San Francisco, but I don't do that anymore," was out of my mouth, I heard myself add, "and if I were being fancy, I'd tell you that right now, I'm in a 'period of reinvention.'" To my amazement, she and her husband laughed appreciatively and said they might have to borrow that phrase sometime. We went on to have a lovely conversation. And yes, I talked a bit about making cheese and knitting. And before you decide I'm crazy for ever thinking we could eat these, I want you to know that they look worse in these photos than when I first emailed David. I'm not sure what went wrong with this batch, but it smelled about as good as it looks. One nugget of advice that David offered in our email exchange was that we should always taste our cheeses fresh before we put them to age. We have now tried enough batches of cheese to have an opinion of what tastes great, so we will keep up this practice, now with more educated palates. At the same time our cheese was falling prey to unwanted ecologies, I completed knitting a trio of children's accessories I designed in Sincere Sheep's Vitamin C color of Shepherdess yarn. I started with a pair of convertible gloves, moved on to a reversible cowl and finished a coordinating hat the other night. All three designs have already been through at least two iterations each at this point because Wyatt is so clear on how he wants his accessories to fit. He loathes floppy cuffs on gloves or mittens, for example. In the coming days, I'm planning to take some photos, figure out how to write the patterns, actually write the patterns, find someone who can act as a technical editor for my patterns, and figure out how to open a shop on Ravelry. I'm curious whether I'll enjoy this process and whether anyone will respond to my virtual cry of, "Patterns for sale!" in the ridiculously saturated marketplace of knitting designs. But I'm getting ahead of myself. I've always felt like I'm winning at life when I find the marvelous things and unique details I can bring to what I do. Whether I'm an expert or a novice, and whether the result is amazing or absolutely stinks (even literally, sometimes), I want to feel grateful to be doing my work and learning from it, instead of focusing on how long it's taking and how imperfectly it's turning out. That perspective shift is going to take some practice. *Who knew there was such a non-judgmental way of saying your cheese is bad? "Mom. Why couldn't I try any of the cheese snacks after your class?" "Well, the snacks were in the classroom, and the only way you'd have been able to try the snacks is if you had been willing to come into the classroom, and you weren't. That's fine, of course—you didn't have to go in. But the snacks weren't coming out." "Oh. Right. I wish I had felt like going in." "Yeah, I know. Maybe another time." Just the other week, David Asher was in the Bay Area, and I got to meet him not once, but twice! The first time was at his Wednesday evening book signing at Omnivore Books. I couldn't have been more pleased with his Monty Python-inspired inscription in our copy of The Art of Natural Cheesemaking. The book signing also included a kefir and cultured butter demonstration, and David offered everyone who attended the opportunity to take home their very own pet for making cheese: a grain of kefir culture. It was pretty terrific to meet David and his lovely partner, Kathryn, in person and get hugs from them across the demonstration table. The second time I met David was several days later, on Sunday, at his Alpine and Blue Cheese workshop hosted by Pollinate Farm & Garden in Oakland. Originally, I had planned to head to Oakland without Marc or Wyatt and simply attend the three-hour class with our friend, Darcie. But that plan changed on the evening of the book signing when I unfortunately let slip to Wyatt that I was going to meet David and get our book signed. The poor boy started to cry because, as he said, "It's not FAIR that YOU get to go and I have to stay HOME!" I immediately made a quick (and clunky) course correction: I lied. I told him I had gotten confused and I actually had to go to a meeting for school that night, but we could probably meet David later in the week when I had my class. Wyatt calmed down right away and agreed that plan would be fine. In light of Wyatt's keen interest and my lie, it seemed only right to do my best to give him the chance to meet David over the weekend. Accordingly, Marc and I planned that we would all spend Sunday in Oakland. We met Darcie for brunch, and then all of us then headed over to Dimond Recreation Center. The plan was that Marc and Wyatt would hang out while Darcie and I attended class there. They would come back for me after class, and then Wyatt could meet David. Darcie and I were early for class, so we got front row, center seats in a class of about ten students. Overall, the class was great. The only disappointing part was that the stove at the facility was broken, and because only one hot plate was available, we were only able to make blue cheese, not Alpine and blue as planned. But David was terrific. He spoke at length and in approachable detail about how and why he discovered and taught himself how to make cheese naturally, kefir, kefir culture, maintaining kefir grains, the importance of rennet and choosing a rennet source, cultivating Penicillium roqueforti, and making blue cheese. I truly admire David's educational approach. He presented a variety of often controversial topics, including the use of animal rennet, the importance of quality dairy products from well-treated animals, freeze-dried cheese cultures, and the value of raw milk, in a way that was never preachy or confrontational. He explained which products he uses and why, and he encouraged everyone to engage in their own conscious evaluation to decide how to proceed with their own cheesemaking. And just like at the book signing, he offered to anyone who was interested their very own kefir grain to take home. And guess what? The Art of Natural Cheesemaking is really the only resource you need to make amazing cheese. There weren't any "secrets" that came out during class that aren't in the book. Moreover, the photos and descriptions are terrific representations of what you need to achieve at every step of the cheesemaking process. So while I would highly recommend attending any of David's workshops to meet him, experience how he teaches and meet like-minded cheesemakers in your community, you don't need to attend a class to get great results. Just buy the book and follow the instructions. 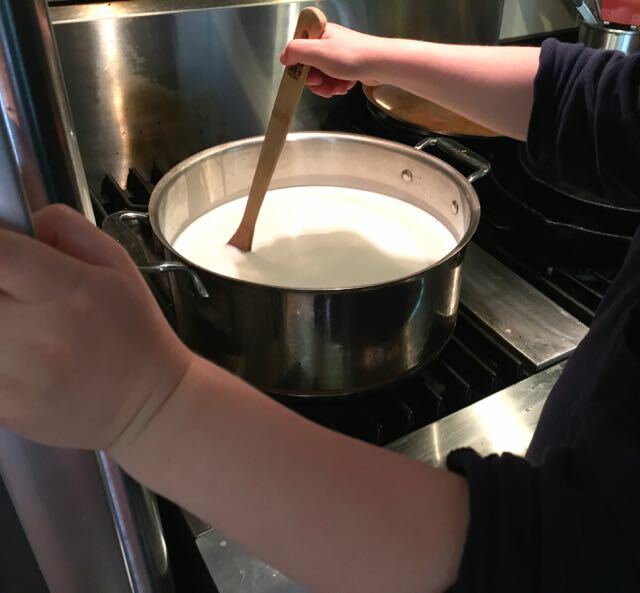 You can use a double-boiler to help keep milk the right temperature while you're allowing the curd to set. When you pour in rennet, just give the pot a quick stir. You can't really over-mix the kefir culture into the milk, but you can over-mix rennet. To dry kefir grains to store them, you can wrap them in a towel and leave them at room temperature. You should flip them every day so they don't stick to the towel. In three to four days, they will be dry, and you can store the grains. When you put them in milk again, they will re-animate and start producing kefir. When you drain your cheese on a stainless baking rack, be sure to put them first on a bamboo sushi rolling mat so that you avoid any rust on your cheese. You can age your cheeses in the refrigerator if you can't find a space that is about 50 degrees Fahrenheit. If you age the cheeses in the refrigerator, it will take 30% longer. 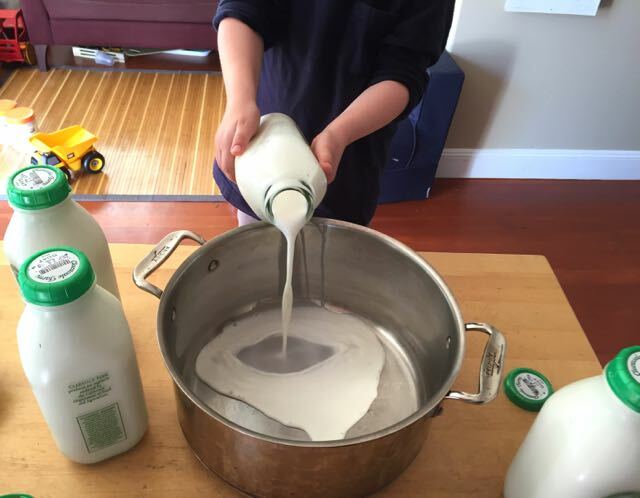 You can make the recipes in the book that call for 5 gallons of milk with 2 gallons. The cheeses will be smaller, so they will not be able to age as long. As a result, the smaller cheeses won't be as amazing as if you had made the full recipe, but they will still be great. 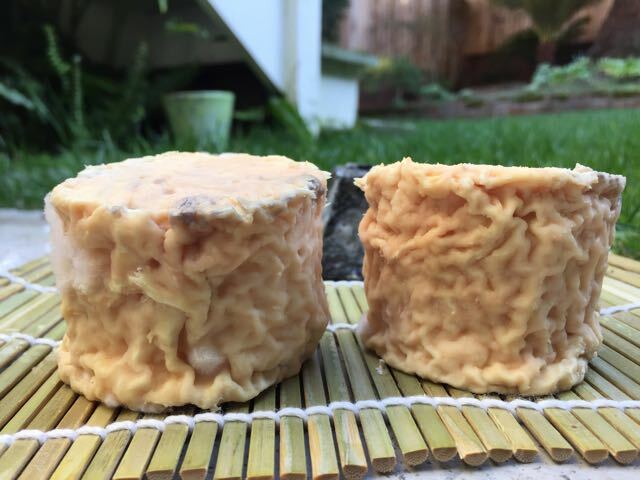 If you use a plastic bin for your cheese aging cave, it doesn't have to be exactly at 90% humidity. Just wipe down any water droplets that accumulate on the inside surfaces of the box every day or two, and the humidity should be fine. All of us grown-ups took Wyatt's emotional short circuit in stride. After chatting for a couple of minutes, I gave David his gift bag. He immediately opened the cheese, took a long, appreciative sniff, and exclaimed, "And look! It's so gooey!" He also remarked that just that morning he had run out of sauerkraut—how wonderful that he now had some more. Even though Wyatt hid during this entire exchange, he made it clear to me later that he had listened to every word. He was beyond delighted that David appreciated the presents. And he is still lamenting having missed out on the snacks after class. *Crazy, I know. But I swear it's true. **What can I say, other than that the dear child must have been starstruck. "This cheese doesn't smell like much...I want to wrap this cheese MYSELF. STOP HELPING ME. How much longer until we can eat this?" When Wyatt was a baby, there was a flurry of discussion around how French parents raise their children. Most of it stemmed from Pamela Druckerman's book, Bringing Up Bébé, which I found thoroughly enjoyable. The book reviews, articles, and interviews surrounding Bringing Up Bébé often focused on how well French children eat, even in daycare. Without exception, it seemed tiny children ate multi-course lunches created from a wide variety of fresh ingredients. The children sat for the whole meal, used a knife and fork and drank politely from a glass that was made of actual, breakable glass. The whole scene sounded so perfect that it made me want to trade-in our cultural food identity. I did not want to raise a notoriously picky eater who behaved atrociously at the table. 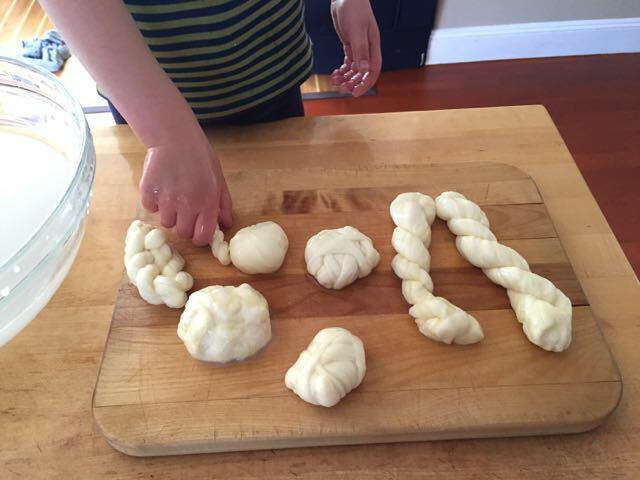 I wanted to raise a child who was, broadly speaking, French about food. I realized I stood very little chance of ever pulling this off, considering I'm an American who has eaten innumerable sad desk lunches and has experienced French food life only while on vacation. And yet, likely because I'm an American, I figured there was no harm in taking a whack at it. We were already on the fringe of standard American food life, after all. For example, before Wyatt started eating solid food, our pediatrician suggested that a great first food would be beef stew. I remember blinking a couple of times and asking, "Really?" before accepting the challenge. After that appointment, I found a great butcher, made my first beef stew, and then I puréed most of it for baby Wyatt. Beef stew aside, I felt I needed to improve my cooking range and abilities. I started looking at what French kids eat, and I realized I didn't know what half of it was, never mind how to cook it. I read Karen Le Billion's posts of school lunches in France, and as I translated them and looked up recipes, I began to feel daunted: Variety! Balance! Sauces! Cheeses! It seemed like a lot, and at the time, I had a somewhat limited cooking repertoire. But it all began to make sense for me when Wyatt was 18 months old and Marc bought me Wini Moranville's La Bonne Femme Cookbook for my birthday. La Bonne Femme remains one of my favorite cookbooks. The recipes are straightforward, easy to prepare, and great to eat. The flavors Wini Moranville highlights make for truly delicious meals with just enough flair to make me feel a little bit fancy without extra work. Thanks to this book, I finally learned to cook meats with pan sauces, and I began to appreciate really simple salads. In a short time, I was applying what I had learned from the recipes to make widely varied lunches for Wyatt and me. I'd prep the ingredients in the morning while he was eating breakfast, and then I'd cook our lunch in under 30 minutes starting around 11:30. Chicken Calvados was one of our favorites, and all of her simple salads, including grated carrot salad and celeri remoulade, were in heavy rotation. I took our lunchtime cheese course pretty seriously, too. I did my best to choose small pieces of different kinds of cheese at the cheese counter so that we'd have a wide variety over any given week or two. One of Wyatt's favorites from the beginning was brie, Fromager d'Affinois, to be exact. It's still one of his favorites, and brie is the cheese he has been most excited to make since we started working from The Art of Natural Cheesemaking. Much to Wyatt's disappointment, we couldn't start a brie (or Camembert-style) cheese for awhile because it has been simply too warm for us to age it in the garage. We did, however, start a recipe about a month ago. During the first week of aging, we wiped down the rinds of the cheeses every other day with a cheese cloth dipped in the washing brine we had prepared from the reserved whey. Initially, we had no place in the garage that was cool enough (50 degrees) to keep the cheese cave. I emailed David Asher, curious if close to 60 degrees would be acceptable. He suggested that we try the refrigerator instead. So the cheese lived in its cave in the refrigerator for the first week. After that, the weather cooled a bit more, and I located a spot in our garage that was consistently about 50 degrees, so I moved the cave there. The next challenge became how to maintain 90% humidity inside the cave. It was easy for the first week in the refrigerator when the humidity was low. I just added a bit of clean sponge that I had dampened with water in order to raise the humidity in the cave. But once the cave was in the garage, the temperature was warmer and the humidity stayed stubbornly at 99%. Even worse, one of the cheese rounds wasn't getting the puffy white mold on it. It was staying yellow and a little sticky, which wasn't good. I swapped out the cheese aging mat for a dry one, and I added some silica gel packets to the perimeter of the cave. Those adjustments resulted in no appreciable change. Wyatt and I then tried making our own packets of calcium chloride, otherwise known as pickle crisp, to place at opposite ends of the cave. The first packets we made worked almost too well, and the humidity dipped to 80%. We remade the packets with fewer granules, and that seemed to work better. Regardless, I continued to monitor the humidity levels in the cave daily because the whole process of adjustments had been so incredibly imprecise. This weekend, it was time to wrap our cheese in cheese wrapping paper so it can continue its aging process for another month in the refrigerator. The rounds are now tucked safely in the back of the cheese drawer. And tomorrow, Wyatt and I are planning to make Chicken Calvados for dinner, for old time's sake. *Our cheese cave is almost embarrassingly basic. I bought a shoe box sized plastic box with a lid at our little, local hardware store, and that's the cave. I place a bamboo aging mat on the bottom of the box, and I use an inexpensive hygrometer that I picked up in the garden center of a large hardware store. Because we had a mouse problem in our garage several months ago, I put the shoe box sized box into a slightly larger box with a locking lid. "Mom. These soft mold wrinkles are just so beautiful! This is definitely the most beautiful cheese we have made." I love Wyatt's perspective on mold. Some mold really is stunning. But to be honest, before I got into fermenting, I held my nose and flung into the compost bin whatever I found decomposing in the back of the crisper. These days, though, we spend a lot of time examining mold. Sometimes, food spoils in spectacular fashion, like when it grows "cat's hair mold." And other times, when we manage to harness the microbes we want, we get beautiful cheese. I haven't written about cheese in awhile, but we have been working steadily behind the scenes. Over a month ago (on November 21, actually) we started making Mason Jar Saint Marcellin. Saint Marcellin cheese is from Lyon, France, and is traditionally made in little clay pots. It is a rare aged lactic cheese made with cow's milk. In The Art of Natural Cheesemaking, David Asher explains how to make Saint Marcellin in shorty mason jars. The jar itself provides the ideal aging environment for the cheese, so you don't need a cheese cave. Mason Jar Saint Marcellin seemed like the perfect cheese for us to try while we waited for the weather to cool off enough to set up our cheese cave in the garage. Saint Marcellin starts out like the feta and chèvre we have made, except for the obvious difference that it uses cow's milk instead of goat's. 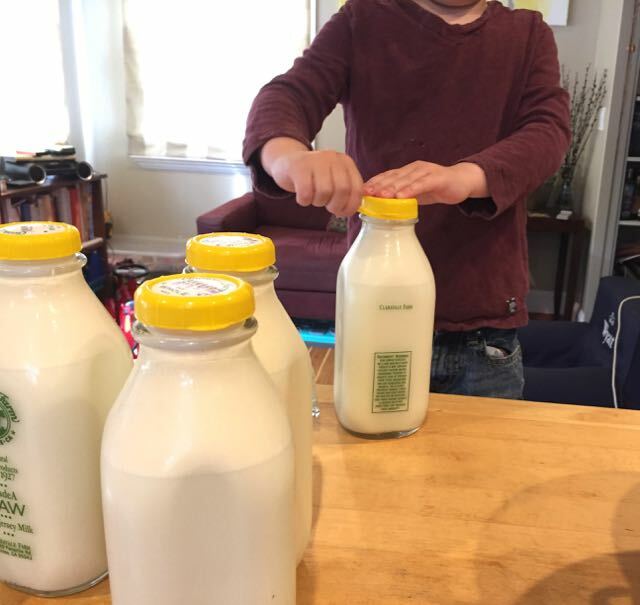 We took a gallon of raw cow's milk, heated it to baby-bottle warm, and added active kefir and rennet. 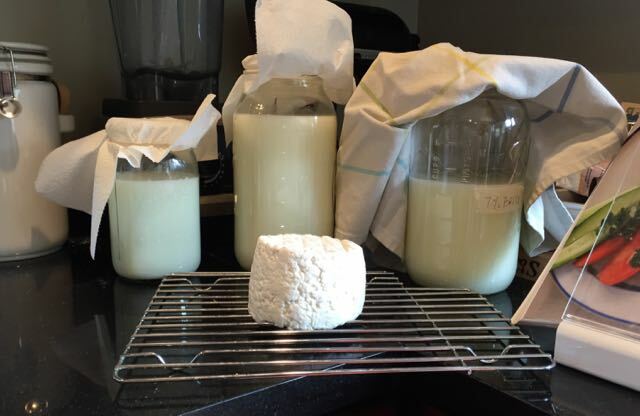 We fermented it until Geotrichum candidum bloomed, and then we drained the curds. After a day of draining, we added salt, and then we let the curds drain for two more days. Once the curds had drained, it was time to pack them into jars. We sealed the jars loosely. On November 27, we placed the jars in our garage, where the temperature was about 60-65 degrees Fahrenheit. We opened and checked on the cheese daily. In ten days, we had an impressive coat of Geotrichum candidum on the surface of all the cheeses. On December 7, we closed the jars tightly and stacked them in the refrigerator. 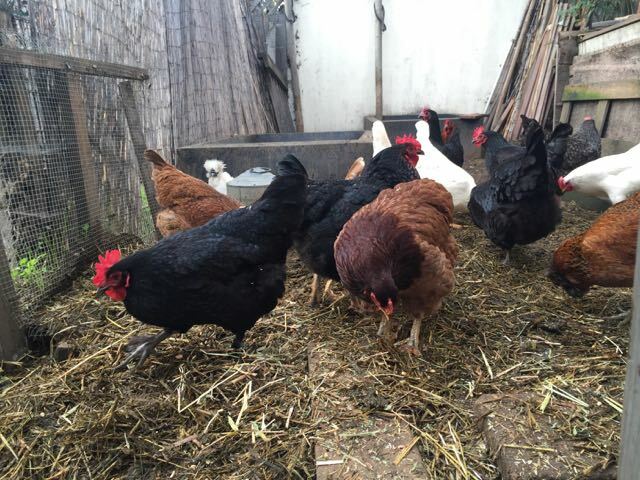 We check on them twice a week, wipe off any moisture on the lids, and place them back in the refrigerator. In the back row, from left to right, we had: Dunbarton Blue, our very own Mason Jar Saint Marcellin, Fat Bottom Girl, and a lovely California Crottin. In the front row, from left to right, we had: our own homemade creamy feta, Jeff's Select Gouda, and Monte Enebro. We ate our cheese with homemade gluten-free sourdough bread, black eyed pea soup (with Super Lucky 2016 black eyed peas from Rancho Gordo), and Ethiopian-style collard greens. The Saint Marcellin was still a little young, but it was already incredible. The top quarter inch or so of cheese had gone, as Wyatt said, "liquidy," and the rest of the cheese had begun to soften but still retained a sort of puffy, slightly granular texture. The "liquidy" section was the most delicious part--creamy like a ripe brie but with a bright, slightly sharp flavor. The rind was so thin and delicate, it was practically nonexistent. We ate the entire jar that evening. As the aging process continues, more and more of the cheese will liquify like the top layer of the jar we already enjoyed. We plan to let the remaining four jars of cheese age for another several weeks in the refrigerator, fully confident that the cheese will be worth the wait. Meanwhile, we also have two separate cheese caves going in the garage. 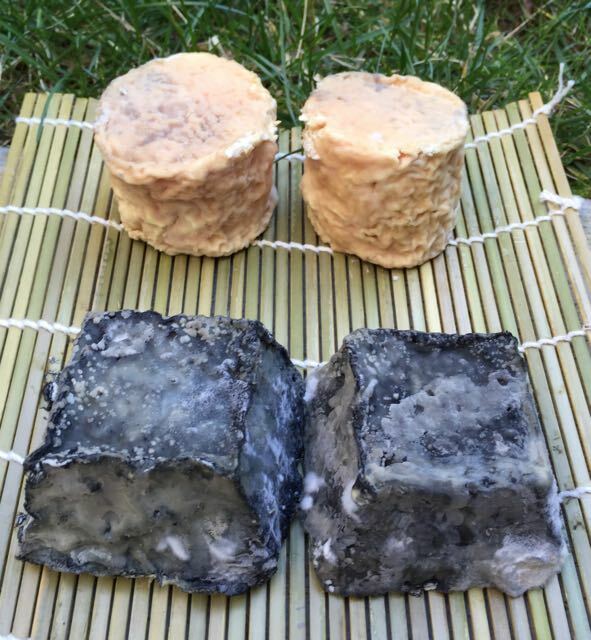 One is for Camembert that started aging on December 12, and one is for Crottins and Valençay cheeses. That one went into service yesterday. And because you will never guess what we did with the last slice of sourdough bread from dinner on New Year's Day, I will tell you. We have inoculated it with a pea-sized piece of Cowgirl Creamery Rogue River Blue Cheese so we can grow our own Penicillium roqueforti mold and make our own blue cheese sometime soon. 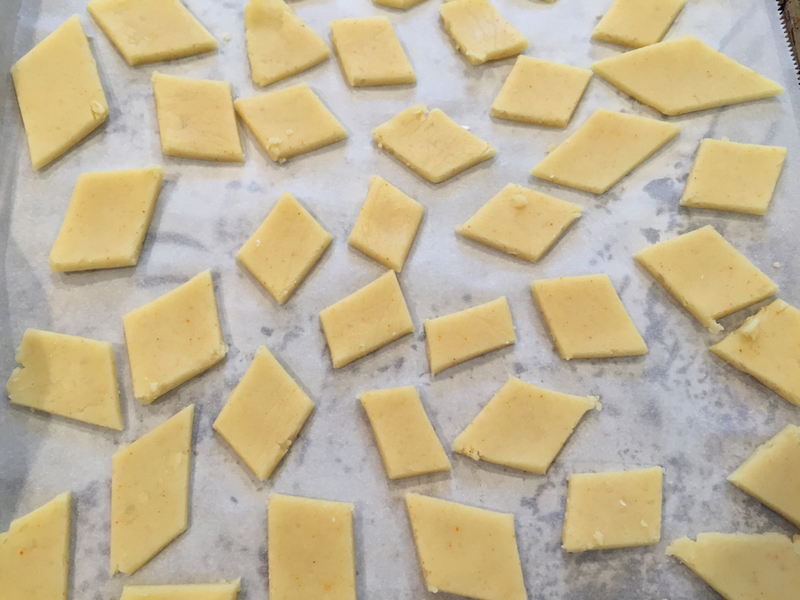 One downside of a blog is that it's not the greatest place to post little updates on things like cheese that have just been coming along at their own pace for the last couple of months. But the cheese has indeed been coming along, as you can see. Homemade Creamy Feta, Shankleesh and Classic Style Feta in the back; Fern's Edge Feta in front. As you may remember, we started a classic style feta, a creamy (or Bulgarian) feta, and a middle-eastern yogurt cheese called shankleesh. We then did our best to forget about them. Benign neglect, really. The shankleesh lived in the garage, and the jars of feta lived in the back of the refrigerator. Over the past many weeks, our three cheeses have been aging and we have been tasting, and now that the cheeses are gone, I can honestly say they were great. Maybe they were even outstanding, if you consider that they were our very first attempt at aged cheeses. And we were very patient. After I had counted, Wyatt put a sticker on the calendar to mark the day that our creamy feta turned 30 days old. When that day arrived, Marc, Wyatt and I tried all three cheeses. The shankleesh was really full-flavored thanks to the tangy yogurt and herbs. Wyatt claimed it was sour and didn't enjoy it. The fetas, on the other hand, while definitely fetas in texture and appearance, were still pretty mild and frankly a little boring in flavor. So all the jars went back to their aging locations. A month later, we tried the cheeses again. But we were even bolder than just tasting them ourselves. We carried them with us when we flew to visit friends in Los Angeles. I packed the cheeses in containers in Wyatt's lunch bag (without brine or oil, lest they be confiscated by TSA) and guarded them in my carry-on. We enjoyed all the cheeses with our friends during lunch at their house the day we arrived. Fortunately, the cheeses had either remained the same or improved somewhat over the last month. The shankleesh tasted the same, but the fetas had definitely changed. The more classic feta had become softer and saltier. The creamy feta had become drier and deliciously tangy, but remained only slightly salty in flavor. A few weeks after our Los Angeles trip, we brought the cheese out for another tasting, this time with some local friends. Once again, the shankleesh didn't taste much different. But with the fetas, the same flavor trend had continued. The classic feta had become almost too salty to enjoy on its own, and the creamy feta was still tangy, showed even more complex flavors, and remained only slightly salty. 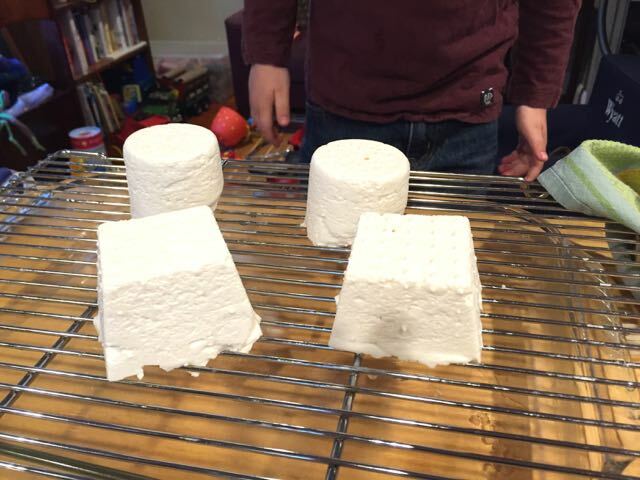 During this last tasting, we tried our homemade cheeses beside a commercially available artisan goat feta, Fern's Edge, that I had found at Rainbow Grocery. The Fern's Edge feta was amazing, of course, but what shocked me was that it wasn't actually better than the creamy feta we had made. We achieved some wonderful flavors in our cheese that weren't present in the Fern's Edge. And even though I had mentally downgraded our classic feta because it had taken on so much salt, after trying some commercially available sheep's milk feta last weekend, I found myself stunned at its saltiness and its similarity in texture to our classic feta. I started to think that there may not have been anything wrong with our execution of our classic feta after all. These successes have been more than enough to encourage us to continue trying to make aged cheeses. Now that the weather is cooler, we have started to think about trying aged goat cheeses and camembert. We are even ten days into aging a mason jar marcellin from The Art of Natural Cheesemaking. Here's a photo of our cheese so far, with Geotrichum candidum well-established on the rind. The cheese smells a lot like camembert, and I find its wrinkles adorable, the same way I find wrinkly Shar-Pei dogs adorable. I am still astonished that this remarkable little pot of cheese started out simply as raw milk and kefir culture. But more on the story of this cheese later, in its very own blog post. Meanwhile, this jar and its four siblings went into the refrigerator today. We'll check them again in two weeks to see how they're doing. After listening to David Asher on Cutting the Curd and Fuhmentaboudit!, I was inspired to make his favorite cheese: chèvre. As he promised in The Art of Natural Cheesemaking, this cheese was very straightforward and required very little active time. Look at this beautiful chèvre! We got about a pound and a half of it, too, which is terrific. We ate it for snack on some crackers, with apples and honey. I also put some into a vegetable frittata for lunch yesterday. For as simple as this cheese is, would you believe that we may have had another cheese fail along the way? Here's what happened. On Wednesday, I set up our kefir to culture so we would be ready for cheesemaking on Thursday. Thursday, morning, I went to Rainbow Grocery to buy four quarts of Claravale Raw Goat's milk. The milk was delivered that day. In fact, I had to wait for it to be taken off the truck. I brought the milk straight home, refrigerated it, and after school, Wyatt and I set to work making cheese. Right away, we noticed an issue. The milk smelled strong. And while the milk didn't taste horrible, it didn't taste good. It had a strongly acidic and goat-y flavor, and there was no way either one of us would have even entertained drinking it. But this was only the fourth time or so that we had purchased goat's milk, and I wondered whether it was just we who had a problem with it. Maybe this milk was within the acceptable range of goat milk flavors. Or maybe the idea of doing another hour-plus round trip to the store with drippy milk bottles was just more than I could handle. We decided to move ahead with the cheese to see what would happen. As usual, we poured and heated the milk, dissolved the rennet, added the kefir culture, added the rennet, and then left the cheese to ferment. The period for this cheese to ferment is 24 hours at room temperature. The cheese that resulted was definitely weird. The curd was firm, full of holes and spongy. You could actually wring out the whey from it. It looked nothing like David's photos, and it tasted strong. The flavors were more like the milk had been clabbered, so maybe there was something that had happened with refrigeration during the milk's transit to Rainbow. I emailed Claravale to find out what might have happened, but they never responded. We ate some of the cheese, crumbled on tacos on Friday. None of us suffered any ill effects, but we weren't that eager to eat more of it. On Saturday, I bought more goat's milk and we tried it again. This time, the milk tasted good and only mildly goat-y. And the curd we achieved looked like David's photos. Even better, the cheese tastes amazing. I think the (admittedly obvious) lesson I have learned from this recipe is that we should trust our noses and taste buds, regardless of when the milk was delivered. If there's something off with the milk, the cheese will be off, too. If anyone has any experience with goat's milk and can let me know what may have been wrong with the first batch we tried, I'd love to hear it. Please leave a comment! "I just need to finish building this helicopter, and then I can make cheese." We've been working on mozzarella for the last week, following the recipes in David Asher's The Art of Natural Cheesemaking. Or, I should say, we have mostly been following the recipes. Our first mozzarella attempt was last Monday, and it was our first cheese fail. 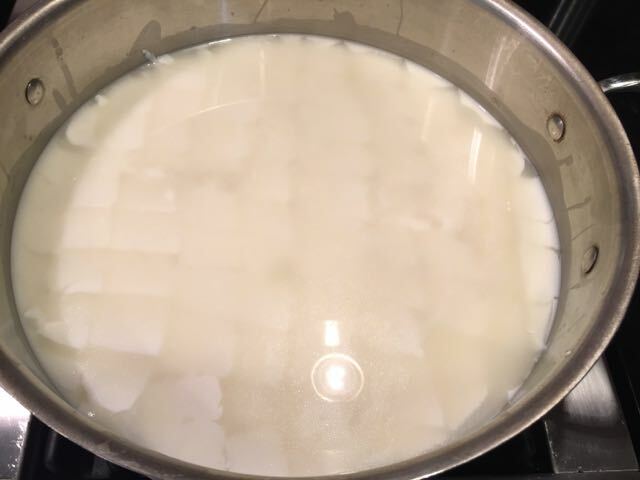 "Fast mozzarella" is cooked and ready to stretch in about an hour, and it has a very mild, sweet milky flavor because it has not fermented at all. But we didn't learn what it tastes like last Monday because the curd never set in our cheese pot. Luckily for me (and probably unfortunately for him), David Asher has proven to be the kindest, most supportive cookbook author ever. Last Monday, because we were in the middle of an email conversation about his slow mozzarella recipe, I told him about our fast mozzarella fail. He very gently asked whether I had forgotten to add the rennet. I hadn't, as you can see from this photo (also, I should have used a spoon, not a whisk), so the failure remained mysterious until yesterday when I remembered that I had used tap water to dilute the rennet. I also recalled that at the time, Wyatt had asked me why I wasn't using bottled water, like I had the other times we made cheese (and as David says in his book to use). 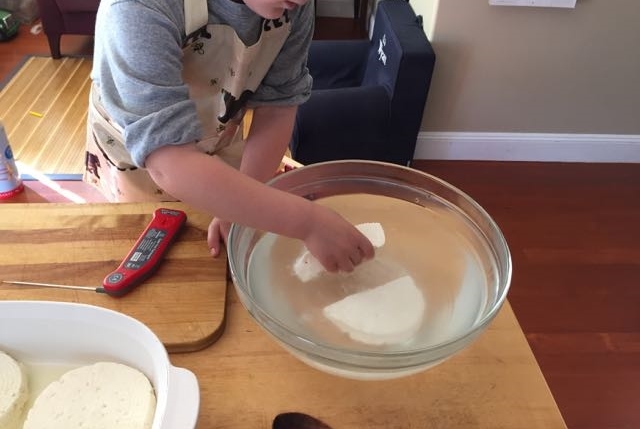 I had told Wyatt it probably didn't matter whether we used tap water with the fast mozzarella because there was no kefir culture in the fast mozzarella recipe. I was so wrong. A little research yesterday proved that chlorine in water makes rennet ineffective, and while I have been unable to confirm whether whether chloramine (which is in our tap water) has the same effect, I'm pretty sure that it must. We tried the fast mozzarella again on Thursday, with improved results. But the curd stayed pretty soft. That time, I had used the remaining tiny bit of a bottle of water and topped off the quarter cup I needed for rennet dilution with tap water. Even though our finished cheese slumped, we had decent success and a huge amount of fun stretching the cheese into crazy string cheese shapes. Our next recipe to try was slow mozzarella. 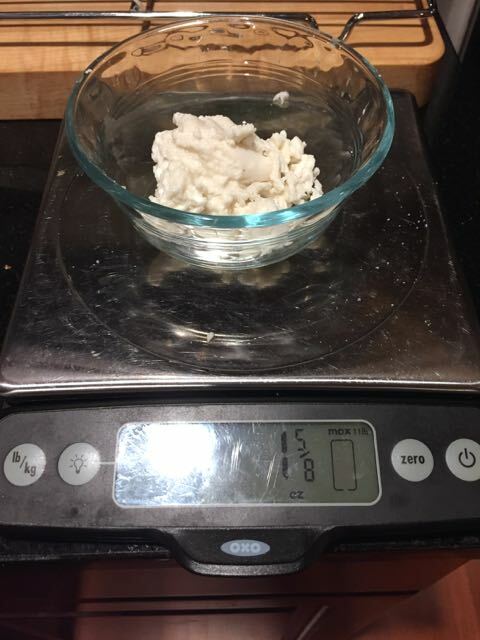 This was the recipe I had emailed David about initially, because the recipe states it takes between 8-12 hours to complete, and you have to test the curd for stretchiness every hour. There was no way Wyatt and I would be able to hang with this project for 12 hours. If it took the full 12 hours, Wyatt would be in bed by the time the fun of stretching came along. And paying attention to cheese every hour for 12 hours, not knowing when we'd have to stretch it, was too much uncertainty. Fortunately, David had a suggestion. He said we could prepare the cheese, ferment it in its whey in the refrigerator for 24 hours, and then knead, stretch and shape it. That plan was totally doable. Because we wanted the cheese to be ready to stretch around 2:30 or 3:00 pm on Monday, we needed to get it into the refrigerator by Sunday afternoon around the same time. And because the rest of the process would take about 4 hours, we would have to start the cheese around 10:00 am on Sunday. So that's what we did, and it worked perfectly. I have to note, though, that Wyatt has become more selective about the parts of cheesemaking he wants to do. This time, he decided he'd rather go outside to play than dissolve and pour in rennet, and he didn't really care about cutting the curd or stirring the pot of curds every 5 minutes for an hour. So I did those steps. The cheese forms, on the other hand, were new, so he definitely wanted to fill those. And he definitely wanted to remove the cheese from the forms and put them into their bath of whey. And because he knew how much fun the cheese stretching was, he had no problem setting aside Monday afternoon for stretching and shaping cheese. 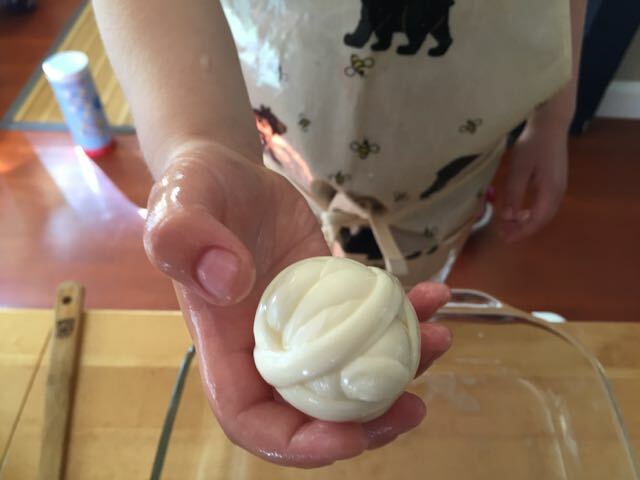 We could have attempted to make tender mozzarella balls, but we decided it was much more fun to overwork the curd and make string cheese. So we made Oaxacan string cheese and Majdouli, a Middle Eastern string cheese that incorporates nigella seeds. The flavor of the slow mozzarella is much, much better than the fast mozzarella. It's still mild, but it's more complex and less sweet. We ate some for dessert with apples and honey, and it was so good. But the lessons for me from this mozzarella adventure are that I should heed the recommendations of my assistant and always use bottled water to dilute the rennet. "Oops. Mom. I smushed that little part off. But it was by accident, and it's only a small piece. So it's okay, right? And I can probably eat it, now, right?" Did you know there was such a thing as creamy feta? I didn't. 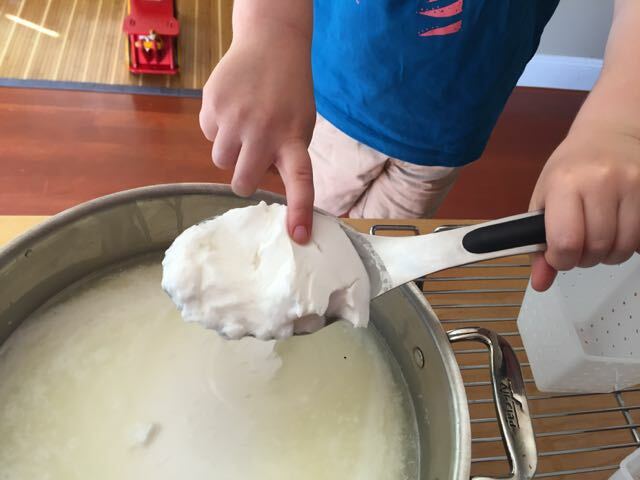 According to David Asher in Chapter 15 of The Art of Natural Cheesemaking, creamy feta is a softer version of feta, made using a lactic curd, like a chèvre, instead of the firmer full-rennet curd that we made last week. Creamy feta is commonly called Bulgarian feta but is now labeled as Bulgarian white cheese because of the Protected Designation of Origin (PDO) protecting the name feta. If the controversy surrounding feta interests you, you can read more about the "feta wars" here. Because "Bulgarian white cheese" is at best an utterly uninspiring name, I'll refer to what we made as "creamy feta." 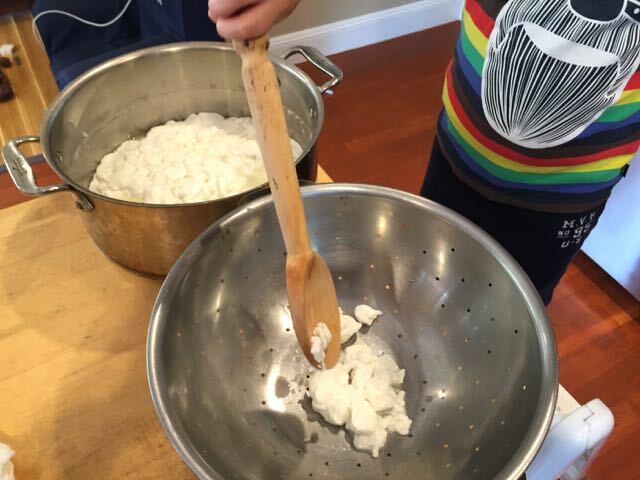 Making creamy feta was a pretty leisurely experience. The recipe said it would take about an hour over three days to make, and that would have been about right if I hadn't had any help. For us, it probably took closer to 90 minutes or so over four days, which was very doable. 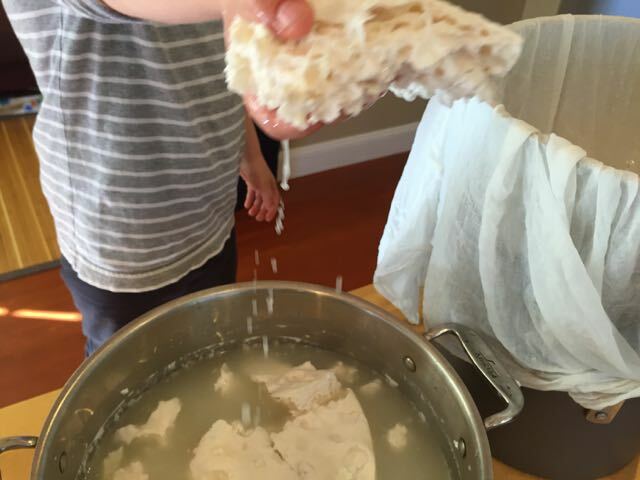 Like our first feta, we made some active kefir culture, and strained it. We heated the raw goat's milk, added the culture and a very tiny dose of rennet dissolved in water. 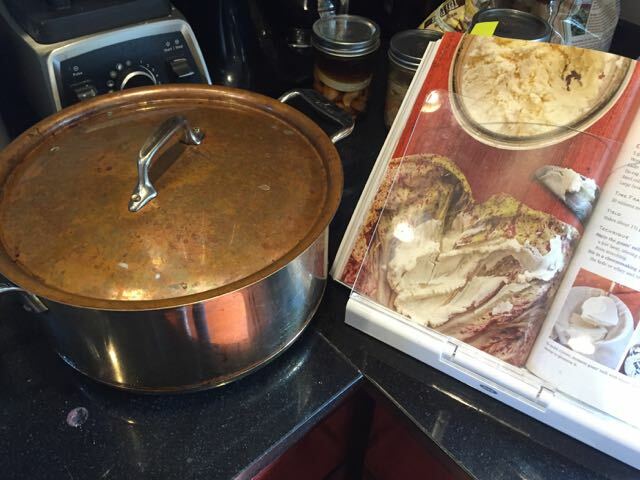 Then we let the covered pot sit out on the counter for a day. 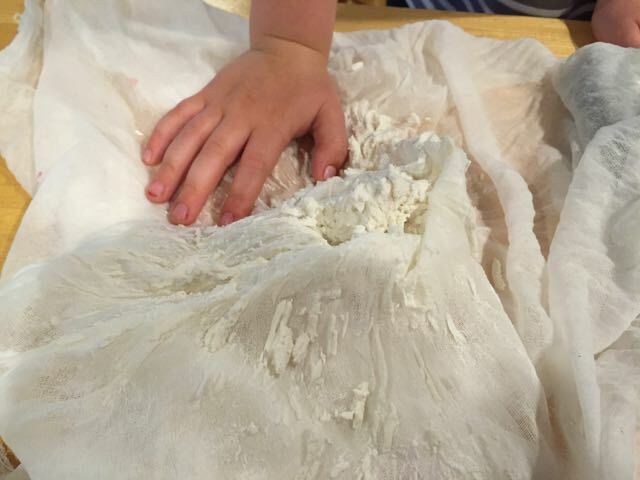 On the second day, we filled our forms with the curds that had formed. Unfortunately, I did not have enough of the proper size and shape forms for this recipe, so we used two crottin forms and two Valençay forms. I'm sure we broke a variety of rules by making feta in the shape of a pyramid, but because I have no idea what those rules are, I'm not too worried about it. We mixed a 7% brine. As the cheeses drained, we flipped them once. On the third day, we salted the cheeses and let them dry, and we attempted a whey ricotta. The yield was very small and the flavor was very strong. The ricotta was also much wetter than our previous whey ricotta. We preferred the whey ricotta from the firm feta over the one from this recipe. On the fourth day, we put the cheese in the brine. Unlike our firm feta, this cheese seems to want to float. The recipe says if that happens, to weigh it down. Wyatt managed to wedge a couple of pieces of cheese into the jar in such a way that they are holding each other under the brine. I have no idea what he did, but I hope it holds because I wasn't able to find something in our kitchen to use as a cheese weight. Now we must wait two weeks for the cheese to age. We're looking forward to tasting the two fetas side-by-side to see whether there's one we prefer. "Dad. Guess what? Mom ALMOST let the whey boil over! You should have seen the foam on the top of the pot!" Before making feta, I did not have a good appreciation of how much of reductive process cheesemaking really is. When I ordered our cheesemaking supplies from The Cheese Connection, the incredibly helpful Kallijah informed me that a gallon of milk makes about a pound of cheese. But what this actually meant in real life was that our gallon of goat's milk made just over a pound of feta, and left about 15 cups of whey. If you're not up on your conversion factors, let me help you out. There are 16 cups in a gallon, so the leftover liquid was only a cup less than our original gallon of milk. I suddenly began to understand why good cheese is so expensive. And I was left with the question of what to do with all that whey. Fortunately, David Asher anticipated this question and included a chapter on "Whey Cheeses" in The Art of Natural Cheesemaking. In the chapter, David provided a variety of sensible suggestions on how to use whey, and there is a picture of him feeding whey to pigs, and a picture of him watering his garden with whey. Wyatt, a child of the California drought, looks for any opportunity to pour liquid anywhere, so he was in favor of finding a pig to feed, or barring that, pouring the whey on our garden. I, on the other hand, a grown-up involved in a Cheese Project, was in favor of trying to make one of the cheeses with it instead. Eventually Wyatt agreed to make whey ricotta. As David explained in Chapter 22, Whey Cheeses, "Italian, for 'cooked again,' ricotta refers to the second making of cheese from one batch of milk: the milk is first 'cooked' to make Parmigiano Reggiano or pecorino or some other Italian cheese, and the leftover whey is then 'cooked again' to make ricotta." We had just over a half-gallon of whey available to play with, because the rest of it had been used for the brine to age the feta, or I had spilled it on the floor. A half-gallon was about half of the amount of whey required for the "Slow Ricotta" recipe, but I figured we could try the recipe anyway and see what happened. If we only got an ounce or two of ricotta, so be it. It's not like we had a pig starving for whey in our back garden. First, we left the whey to ferment at room temperature for 24 hours. Monday afternoon, we poured the whey into a pot and brought it to a boil. David specifically warned in his recipe to remove the pot from the burner right as the whey comes to a boil so it doesn't boil over. 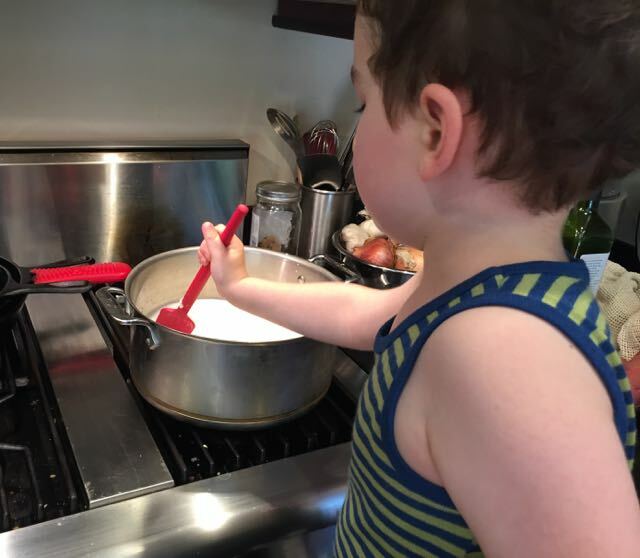 Unfortunately, I forgot for a few minutes that the pot was even on the stove because Wyatt had begun conducting an imaginary orchestra (with they aid of a tinker-toy stick) in Rimsky-Korsakov's "Flight of the Bumblebee" from his San Francisco Symphony Orchestra Concerts for Kids CD. I lost track of the whey, and just as the foam was about to cascade over the rim of the pot, I happened to glance over at the stove, gave a little yelp, and pulled the pot off the burner just in time. Back on task, we let the whey settle, and sure enough, there were little clouds of ricotta curd that had pulled out of the whey. 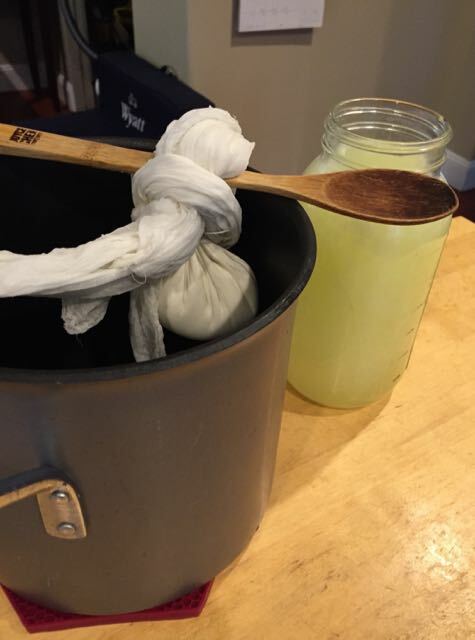 We strained the ricotta in some cheese cloth and hung it to let it drain and cool. Once the cheese had drained (and yes, we probably shouldn't have, but we squeezed the hanging cheese just a little bit to move the process along) and cooled, we weighed it, salted it and ate it for dessert with some fruit. I was impressed that we got almost four ounces of ricotta. The cheese was soft, creamy, and thanks to the fermentation step, had a depth of flavor I have never before tasted in ricotta. "Mom. Can I just please try this? With the salt? PLEASE?" Originally, I had planned to work through the recipes in David Asher's The Art of Natural Cheesemaking in the order that they appear. But as the rest of North America heads into autumn and cooler temperatures, San Francisco is entering summer. I checked the temperature of our normally chilly garage last week, when temperatures were in the 80s and above, and the garage was over 70 degrees. That's way too warm for aging chèvre, which is the next chapter in the book. But we were on a roll, and the idea that our project could be stymied by warm weather seemed wrong, or at least unacceptable, to me. I skipped ahead to the chapter fifteen, on feta: "Feta is a cheese that is aged by submerging it in a brine made of its whey. Started as basic rennet curds, feta is defined by this brine-aging. Brine-aged cheeses are most popular in warmer climes, where salty brines preserve cheeses well despite high temperatures and without refrigeration." Perfect! On Saturday, I bought a gallon of raw goat's milk that had just been delivered to Rainbow. Ideally, we would have started the cheese on Saturday, but Saturday was just too busy. Also, I had forgotten to make the active kefir we would need for our cheesemaking. So on Saturday, I started the kefir that would be ready the next day. 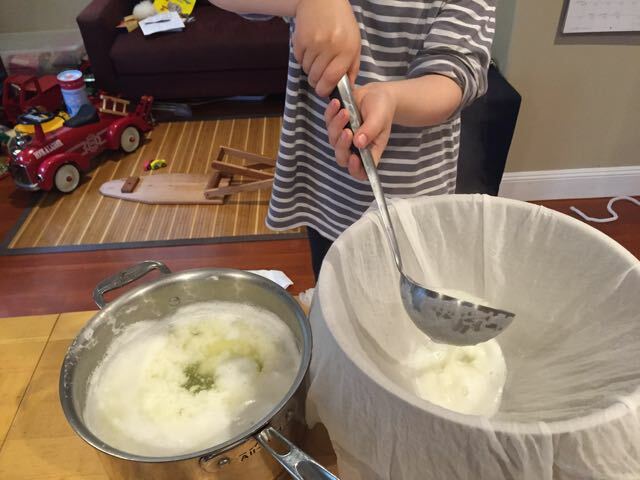 On Sunday morning, the kefir was ready, and we were eager to get started. 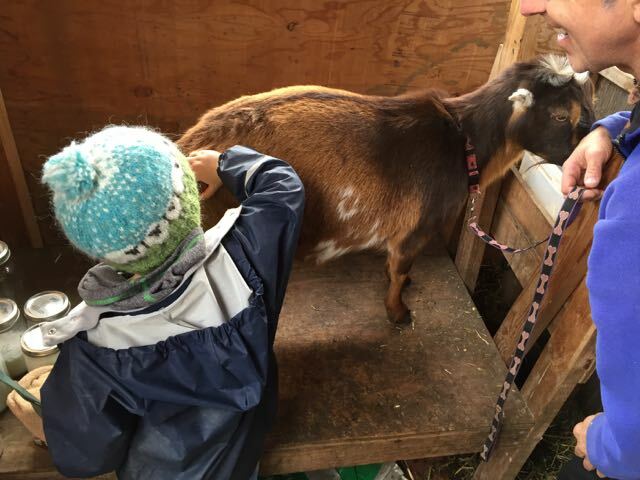 But first, we learned what raw goat's milk tastes like. It's has a pretty distinctive taste, Wyatt said it was like hay. I don't know when he has ever eaten hay, but that's a different issue. He also said he liked the bit that he tried, thought that it tasted nothing like cow's milk, and he added that he probably wouldn't want to actually drink a glass of it. 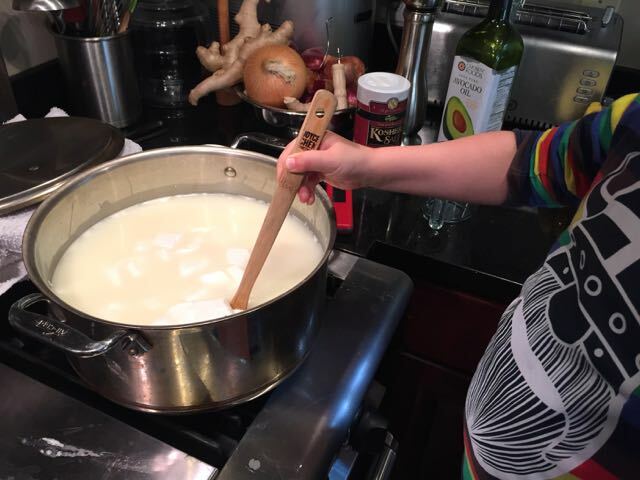 After pouring the milk into the pot, we warmed it, and added the strained, active kefir. We covered the pot to keep the milk at 90 degrees for an hour. Keeping the pot warm was where I made my first mistake. 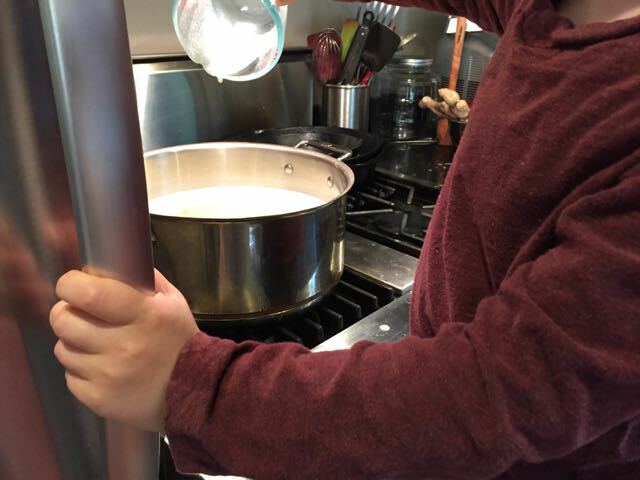 After reading about how hard it can be to keep the milk warm enough, and how your cheese may fail if the temperature drops too low, I wanted to be sure that the milk stayed warm enough. And as you may have already guessed, I overcompensated. I brought out bath towels to swaddle the pot, and I turned the oven on, to keep the top of the stove warm. By the end of the hour, I measured the temperature of the milk, and it had risen to 99 degrees. This was obviously not ideal, but I rationalized (without any science or research, mind you) that it would probably be fine. I told myself that the pot hadn't been that hot for the whole hour, and I also figured that people in hot places drink kefir, so we should just push on. But before we continued with the recipe, we let the milk cook to 90 degrees, and I turned the oven off. Once the milk had cooled a bit, we added the rennet that we had dissolved in water, and then we covered and swaddled the milk pot again for an hour. The stove had cooled off by that point, but I checked the temperature of the milk after 30 minutes, and it was 3 degrees warmer than it was when we started. So I removed some of the towels and uncovered the pot so it could get back to 90 degrees for the rest of the hour. Next, we checked for a clean break of the curd, and we had one. 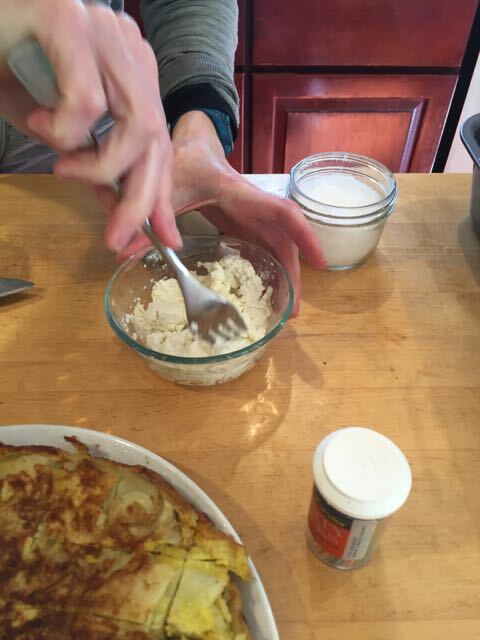 At this point I was absolutely overjoyed that we actually had curd--its was the first obvious clue that we were on the right track with the recipe. 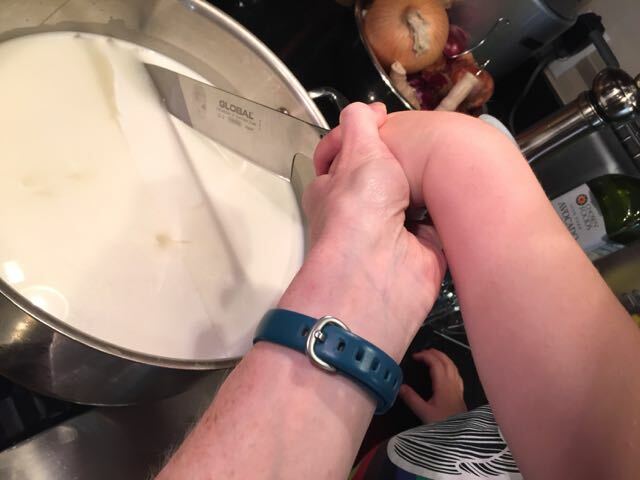 Then we had to cut the curd, which is tricky in a round pot with a regular knife and a 4-year old who wants to do everything himself. But we managed, and the curds that we missed, we just cut them up later as we found them when we were stirring. 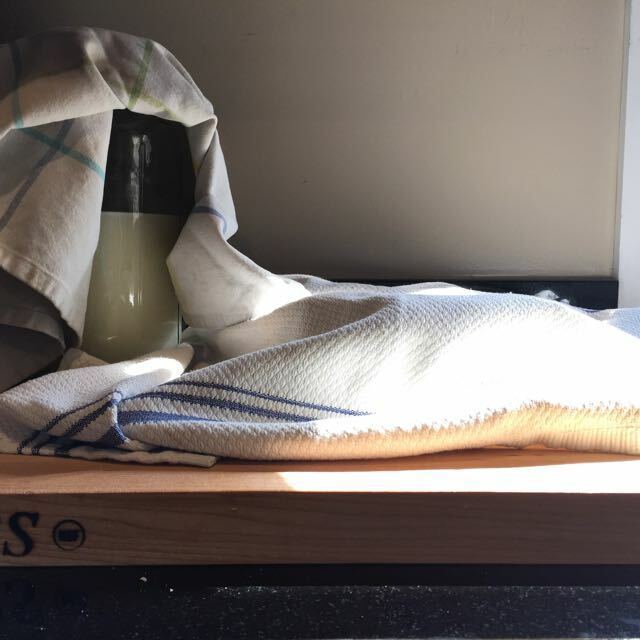 We poured off the whey, salted the curds, and we set up our cheese press from last week, this time with cheese cloth in it, so we could flip the whole cheese occasionally. It worked perfectly. We then prepared our salt brine, and I managed to pour a good amount of whey all over the floor. I also splashed some on Wyatt's socks (he loves to add that part of the story). In my defense, our four-cup glass measuring cup pours terribly for some reason, and I had forgotten how badly it pours until I was standing in a puddle of whey. After the cheese had been pressed and was cool, we cut the block of cheese (which weighed just over a pound) into four pieces so it would fit in our jar with the brine. We salted the surfaces, and we set the quarters of cheese to dry on the aging mat for 24 hours. We flipped them occasionally so they would keep their shape. On Monday afternoon, we checked our cheese, and they had lost another tablespoon or so of liquid. We had no idea whether they should dry for longer or not, but we figured they were probably fine to go into the jar of brine. And good news! They sank right to the bottom of the jar, and stayed there. We put the jar in the refrigerator, and we now have to wait two weeks before we can try them. As Wyatt said, "Two weeks? That's not so long, right? That's like tomorrow, and then after tomorrow, and then it's two weeks!" He has such a good attitude for making cheese. "Wyatt. Stop eating the cheese! We have to press it." 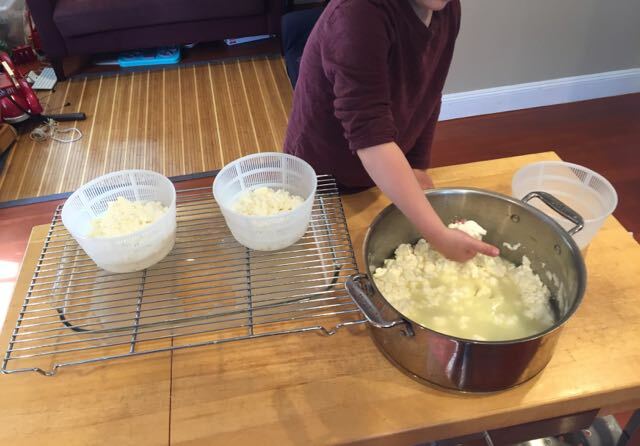 While we were waiting for the Shankleesh, we decided we had plenty of time to make paneer according to the recipe in David Asher's The Art of Natural Cheesemaking (White River Junction: Chelsea Green, 2015). Paneer is a special kind of cheese that is made without animal rennet. 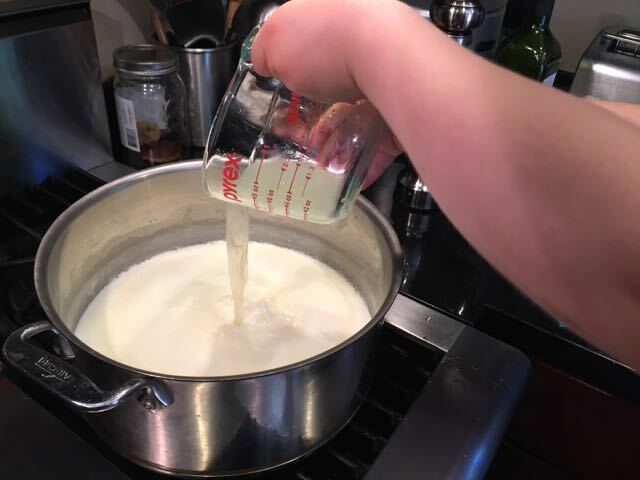 Heat and acid are what allows the milk to curdle, and then those curds can be strained and pressed into a block of cheese. Because of the way paneer is made, it doesn't melt when you heat it. As a result, you can cook it in sauces or barbecue it, and it will hold its shape. 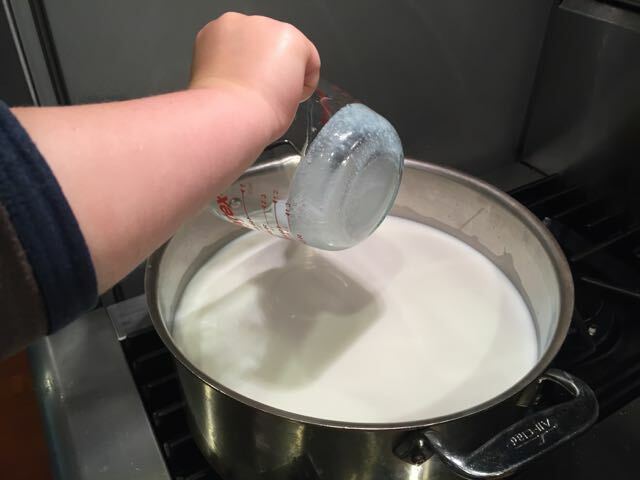 The first step in the recipe is to heat the milk to boiling (which would kill most of the beneficial bacteria in raw milk). We therefore opted for pasteurized milk in this recipe. This recipe also requires a cheese press, which of course we don't have. I learned from a little bit of research that cheese presses start around $200, so buying one is not a good option for us. There are also instructions available online so you can build your own, so maybe we can do that in the future. Fortunately, the author suggested an easy solution to the cheese press problem: two empty plastic yogurt tubs. 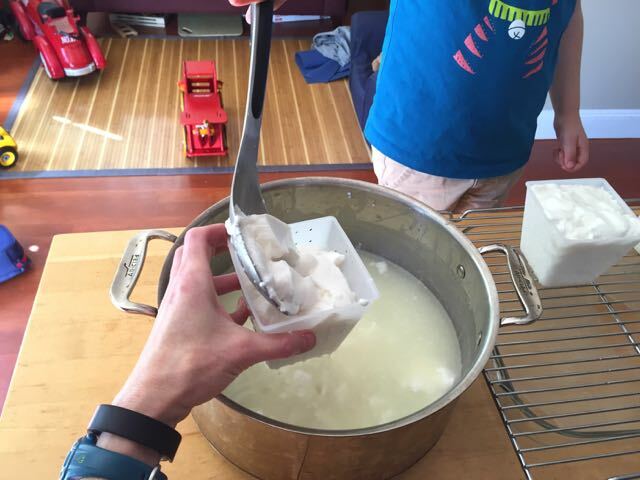 You punch holes in one of the tubs from the inside out, put your cheese in the tub with holes, and then you pour the warm whey into the intact tub, which you place on top of the cheese. The tub of warm whey helps to press out the rest of the whey from the cheese. As much as I try to avoid plastic, this was our best option for making paneer. Wyatt and I went out and bought the cheapest yogurt we could find, for the containers it came in, and took it from there. First, we squeezed lemon juice. Next, we heated the milk to boiling. In went the lemon juice. And like magic, curds appeared! We strained the curds from the whey. We pressed the cheese for a few hours (we didn't hold the press down with our hands for that time, just upon assembly). The paneer popped right out of it's yogurt container when it was done. I let Wyatt do the honors. Snack! Herbed paneer on flatbread with honey, and plum slices on the side. The recipe advises using fresh lemon juice, not bottled, which is my preference anyway. So we squeezed lemons, and then heated the milk. After the milk had boiled, we poured in the lemon juice and watched curds magically appear. We then gently transferred the curds from the whey with a slotted spoon into a colander, seasoned the curds, and set up our press on a rack, over a baking dish. The cheese sat in the press for a few hours, and it was easy to remove from the mold when it was time to eat it. We tasted the paneer with and without salt, and we concluded that salt enhances the flavor dramatically. We added some herbs to fancy it up, and in the spirit of international cheesemaking, we went with herbs de provence. It tastes terrific.